I don’t know about you, but now that Game of Thrones’ seventh season has ended, I feel lost. ‘Thrones’ gave me something to get excited for every Sunday, and now, some reports are suggesting that it may not return until sometime in 2019. If that’s the case, that’s at least 16 months without a ‘Thrones’ fix. The good news is that there are some other killer shows we can all binge—yes, there are other amazing shows—and it’s likely all these offerings will have new seasons to watch each week while we wait. Below are some of our best options to keep us happy during the break. What it’s about: This show tells the stories of some of the most celebrated Vikings in history. Season one primarily features Ragnar Lothbrok, a farmer who is skilled in battle and who wishes to travel west despite the fears that there is no west to find. Vikings is not, however, a one-man show. The story of Vikings is filled with intriguing characters, like Ragnar’s equally skilled wife, Lagertha, and Ragnar’s brother, Rollo. ‘Thrones’ fans will enjoy the stellar battle scenes, intense power struggles, and beautiful cinematography. What it’s about: House of Cards centers on Frank and Claire Underwood, two power-hungry individuals who have devoted their lives to rising in the political ranks. Season one focuses on Frank’s attempts to move up from his position as the House Majority Whip. ‘Thrones’ fans will enjoy the show’s political intrigue, flawed characters, and shocking (and dark) twists. What it’s about: Elliot, a drug addicted genius, is pulled into a hacktivist group called ‘fsociety’ after meeting a man referred to as Mr. Robot. Fsociety hopes to destroy the status quo and take down corporate bankers through an elaborate hacking scheme. Viewers follow along with Elliot’s internal monologue and eventually find themselves wondering, like Elliot, who they can trust. ‘Thrones’ fans will enjoy the suspenseful plot, strong character development, and clever dialogue. What it’s about: This show, based on Michael Crichton’s film of the same name, tells the sci-fi story of a robot-run amusement park in a place called Westworld. In Westworld, visitors can do as they please. However, when things start to go wrong, it looks like some guests may have a better time than others. ‘Thrones’ fans will enjoy the well-crafted plot, gorgeous visuals, and well-cast characters. What it’s about: American Gods, based on Neil Gaiman’s book, follows Shadow Moon as he is released from prison and meets the strange Mr. Wednesday. From this point on, Shadow is brought into a battle he could never have imagined, finding himself in the middle of a fight between the Old Gods and the New. ‘Thrones’ fans will enjoy the dark visuals, growing conflict, and intriguing group of characters. What it’s about: The Magicians, based on the novel by Lev Grossman, follows Quentin Coldwater as he discovers a world of magic and gets a chance to go to Brakebills University for Magical Pedagogy. Though Quentin is accepted to the university, his friend Julia is not, setting both Quentin and Julia on dangerous paths as they learn more about the magical world. ‘Thrones’ fans will enjoy the striking special effects, exciting sense of danger, and intriguing storylines. What it’s about: This show is set in an alternative history where World War II ended very differently from what we know. The United States has now become the separate areas of the Greater Nazi Reich and the Japanese Pacific States. However, propaganda materials are discovered that suggest there was another timeline where the War did not end with the Allied Forces being defeated. The story’s main character, Juliana, quickly finds herself working to protect this information while still trying to keep out of serious danger. ‘Thrones’ fans will enjoy the dark visuals, flawed and fleshed-out characters, and heart-racing suspense. What it’s about: Outlander centers on Claire Randall, who, in 1945, is somehow sent back in time to 18th century Scotland. She meets Jamie Fraser, a Highland warrior, and becomes involved with the people of the time and the war they’re fighting. ‘Thrones’ fans will enjoy the intriguing storylines, eye-catching visuals, and fantasy romance. What it’s about: This show centers on Sarah Manning, a woman who discovers she is one of many clones. She adopts the role of one of her clones after witnessing her death. The discovery of her fellow clones puts Sarah in danger, though, as information about where they came from begins to come to light. ‘Thrones’ fans will enjoy the twisting plot, dark subject matter, and engaging characters. Net neutrality is under fire once again. Lobbyists from big cable companies (like Comcast, Verizon, and AT&T) are putting pressure on the FCC to dismantle Title II, which allows Net Neutrality. Net Neutrality means that right now all sites have equal access to their users (you). Internet providers just provide the internet: they don’t censor legal sites or regulate the speed at which those sites load. This is great for smaller sites and start-ups: the internet is a powerful tool to reach an audience. This is also great for users: access to a free and diverse web is a big part of democracy, free speech, and a free market. What will happen if Net Neutrality disappears? A free and open net is something people sort of take for granted. However, big Internet Service Providers (ISPs) want to control access in a big way, by creating a “fast lane” and a “slow lane” for site hosts. Without Net Neutrality, ISPs can reserve quick internet speeds for the sites that pay for it, leaving the sites that don’t (or can’t) pay for slower speeds. Slow loading speed is really bad for a website’s traffic. A lot of users get frustrated (understandably) if a site takes forever to load, and pictures and video take the longest. The sites that don’t pay for faster speed will lose traffic, and many will go under. A lot of sites will pay for faster speeds to survive, but that could mean that users will then have to pay to use a site that used to be free. You’ve probably at least heard the term because it has been in the news for the last several years. Every time political action brings Net Neutrality into the crosshairs, an internet-wide protest has resulted. In 2007, Comcast got caught slowing/blocking Bit Torrent transfers. 2010: The FCC issues the Open Internet order, which requires ISPs to be transparent about their service management, and not to block or discriminate against lawful traffic. 2012: AT&T held an app ransom: they blocked FaceTime unless customers upgraded. In 2013, under protest, AT&T quit blocking FaceTime. 2014: AT&T allows companies to pay to allow their sites to be exempted from data caps. 2014: FCC begins investigating news that Netflix had to pay to improve streaming speeds. 2014: September 10th was “Internet Slowdown Day,” in which activists and companies with websites displayed a simulation of what a slower web would look like in the hopes of spurring people to get involved. Sites displayed the “circle of doom”—a loading icon. And it works. The deluge of comments once again crashes the FCC servers. 2014: President Obama puts his support behind Title II. 2015: The FCC passes Title II. Broadband is classified as a utility. 2015: The FCC publishes the Open Internet Rules, which ban throttling, blocking lawful websites, or allowing (or making) companies pay for faster speeds. 2016: The Open Internet Rules are affirmed by the D.C. Circuit Court. 2017: The new FCC Chairman, Ajit Pai, announces his plans to change the Open Internet Order. The Notice of Proposed Rulemaking is the first step of the process. Comments are once again being accepted. May 7, 2017: John Oliver does it again. The FCC servers crash again under the stress of so many comments. May 18, 2017: The FCC votes to continue changing the Net Neutrality rules, and the protest continues to rage. July 12 has been dubbed the Internet-Wide Day of Action to Save Net Neutrality (or Day of Action for short). Big and small sites and companies are participating—including Amazon, Etsy, Reddit, FunnyOrDie, Patreon, Deviant Art, Mozilla, Creative Commons, and the Writer’s Guild of America, among many others. Even before or after July 12, you can do something. To participate, visit battleforthenet.com, and send a comment to the FCC and Congress. Hi. My name is Abigail, and I am the new intern at Easy Internet Now. I will be writing the articles and news stories about all things tech here on EasyInternetNow.com. Furthermore, as the content creator, it is my job to introduce the new employees to the world. So, it is my pleasure to introduce myself, Abigail Eskew, to you, world. World, Abigail Eskew. Abigail Eskew, world. Nice to meet you. Charmed, I’m sure. Me: Hello, thanks for meeting with me on short notice. Also me: Not a problem. I’m on the clock anyway. Me: Well…yes. But you are interning for school credit, not cash money. Didn’t you know that? Me: So where do you go to school? Also me: I’m a senior at Missouri State University in Springfield, MO, and I major in Professional Writing. Sorry, what did you say about no money? Me: Professional Writing? And what do you tell your parents you major in? Also me: Ha. Ha. It is a career, and one in demand, I might add. These days the business world reaches a very significant portion of their customers online, and someone has to write all that content. Not to mention user manuals, safety information, proposals, progress reports…hey, wake up! Me: Oh, sorry, I was just resting my eyes. Sooo…you are the friendly face of the money-grubbing corporate world. Tell me, how does it feel to sell out? Also me: Excuse me, I didn’t sell out. I happen to think access to the internet is extremely important, especially to kids in school. Education is freely available to those who want it, as long as they have internet. And besides, I don’t think someone who isn’t being paid can sell out. Me: Keep telling yourself that, corporate jockey. I can’t believe you sold out for no money. What a rube. So what are you going to write first? Some advertisements for your new corporate overlords? Also me: Actually, Easy Internet Now is a company with a desire to help people who otherwise would be left without internet by existing corporations, and set them up with a reliable connection. Me: Exactly. Blink twice if you need help. Also me: …and providing value to our clients. In that spirit, I plan to kick off my content with a series I’m calling Internet 101. It will be a series of informative how-to articles that people can refer back to when they need to. It will cover things like tips and tricks for effective and efficient Google searches, where to put your free modem for the best function and access, and best practices for keeping your personal details safe online. Also me: I’ll also be covering new tech developments, trends and viral content. Me: Ooh, did you see that video with the cats? Also me: I don’t know which one you mean, but probably yes. Me: Those cats are so silly. Also me: Yes they are. Me: Well I look forward to your cat articles, and working with you in the future. Welcome to the company! Also me: Thanks! I’m excited to be here! Help me welcome our newest member of the Easy Internet Now family! You can follow her/me on Twitter @willreadforfood, and please tweet any suggestions about internet skills you would like to develop @easyinternetnow, and I/her will consider including your suggestions in future how-tos! This is why it takes me so long to write anything. Balancing and doing tricks requires visual attention. The fidget spinner craze has been sweeping elementary and middle schools. As of May 17 every one of the top 10 best-selling toys on Amazon was a form of the hand-held toy people can spin and do tricks with. Kids and parents are even making them for themselves using 3D printers and other more homespun crafting techniques. But some teachers are banning them from classrooms. And experts challenge the idea that spinners are good for conditions like ADHD and anxiety. 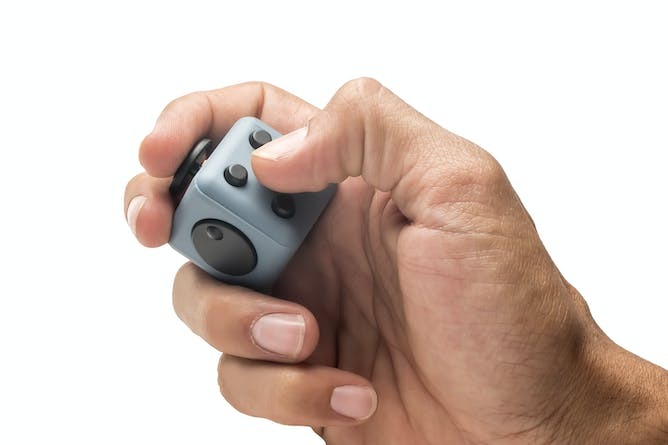 Meanwhile, the Kickstarter online fundraising campaign for the Fidget Cube – another popular fidget toy in 2017 – raised an astounding US$6.4 million, and can be seen on the desks of hipsters and techies across the globe. My research group has taken a deep look at how people use fidget items over the last several years. What we found tells us that these items are not a fad that will soon disappear. Despite sometimes being an annoying distraction for others, fidget items can have some practical uses for adults; our inquiry into their usefulness for children is underway. 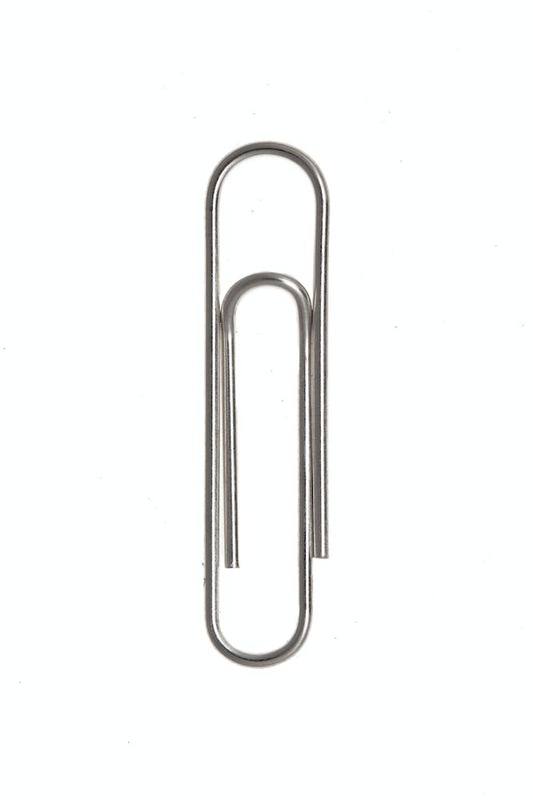 People fidget with everyday items such as paper clips. One thing people often report is that fidgeting with an object in the hand helps them to stay focused when doing a long task or sitting still and attentive in a long meeting. 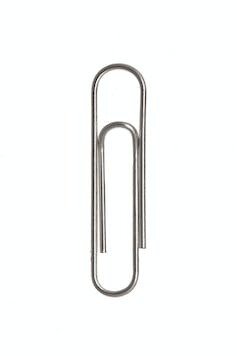 Many examples people have told us about are ready-to-hand objects like paper clips, USB thumb drives, headphone earbuds and sticky tape. But people also buy specialized items like a fidget spinner or a Fidget Cube for this purpose. Another common thread involves people using some fidget objects – like a favorite smooth stone – to calm themselves down, helping them achieve a more relaxed, contemplative, even mindful state. Psychology research about sensation seeking tells us that people often seek to adjust their experiences and their environments so that they provide just the right level of stimulation. Different people function well under different circumstances. Some people like total quiet to help them focus, while others are happiest working in a busy, noisy environment. The optimal level of stimulation (or lack thereof) not only varies among people but even can change for one person throughout the day depending upon what he or she is trying to do. So people fine-tune their environments to get things just right: for example, putting on headphones in a noisy office environment to substitute less distracting noise. A person who can’t get up and walk around to wake up a bit, or go have a nice cup of tea to calm down, may find it helpful to use a fidget item to get in the right frame of mind to stay focused and calm while staying put. Our results align with anecdotal accounts about fidget toys helping children with attention or anxiety issues to stay focused and calm in the classroom. In fact, fidget toys have been available for kids for quite some time. The closest significant research is UC Davis behavioral science professor Julie Schweitzer’s study of letting children with ADHD fidget – wriggling, bouncing or otherwise moving gently in place – while they worked on a lab-based concentration task called the “flanker paradigm.” She found that more overall movement (measured using an accelerometer on the ankle) in children with ADHD did help them perform this cognitively demanding task. Of course, it’s a big step from that finding to a claim that fidgeting with small objects in the hand can work, too. However, therapists tend to focus more on results than theoretical findings. They use what gets results and throw out what doesn’t, so practical experience suggests these toys may help kids. And yet, schools are banning the spinners and teachers are taking them away. The reason is that not all fidget items are created equal. The items that therapists recommend are primarily tactile – a user holds it in a hand and can manipulate it without looking. But fidget spinners require hand-eye coordination. The basics of using a fidget spinner. 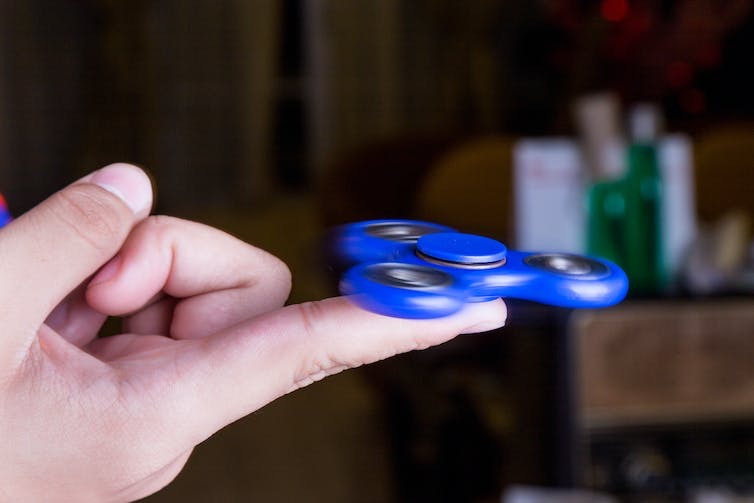 To use a fidget spinner, a person holds the center of the spinner with thumb and finger, and then uses the other hand (or other fingers on the same hand) to get the spinner rotating. Once it’s spinning, there are tricks to be explored, like balancing the rotating spinner on a thumb. Balancing a moving object really requires keeping an eye on it, and doing tricks is a lot of what makes the spinners fun. It’s also what draws the eyes of the user away from the teacher, and likely also the eyes of nearby students. This is the bane of a teacher trying to keep a classroom focused. By contrast, putty, stress balls and other therapeutic fidget items don’t have this visual attention problem. They can serve the same purpose as the spinners, but are more classroom-ready and less distracting. In the same way, the Kickstarted Fidget Cube, too, is probably also more classroom-friendly. Fidget items do seem to serve a valuable purpose. There’s still science to be done, but they’re not just a fad. They embody an enduring phenomenon that nearly everyone uses at some point – just watch your own behavior when doing desk work or sitting in meetings. My research team continues to study fidgeting behavior and design, working to create next-generation smart fidget objects that support managing attention and keeping calm. Welcome to WP Demos Sites. This is your first post. Edit or delete it, then start blogging!